Say it with subs! Fresh ingredients, affordable prices and made-to-order sandwiches make a Subway® Card a great choice for motivating, rewarding or showing appreciation for your employees and customers. Available in values from $5 to $250, Subway® gift and eGift cards are perfect for office giveaways, gifts, or fundraisers. There are no fees or expiration dates and redeemable in over 30,000 locations in the US and Canada. National Gift Card is the best place for you to order Subway® gift cards and eGift cards in bulk. We are the experts in all things gift cards and can set up your gift card and eGift card solutions program for you today. Please contact NGC for more information on Subway® bulk, direct-to-recipient, or individual gift card fulfillment for your gift card program. Contact us online or call us at 888-472-8747 today. The Subway® Card can be loaded with a dollar value and used to purchase goods and services at participating Subway® restaurants in the U.S. and Canada, and certain online venues. The Card may not be used to purchase other Cards and is not redeemable for cash except where required by law. The prepaid card balance never expires, nor are any fees charged in connection with its use. Check your balance at www.subway.com or call 1-877-697-8222. The remaining balance on lost, stolen, or damaged Cards will be replaced only if the Card has been registered and proof of purchase is provided. To register your Card, and for complete terms and conditions, visit www.subway.com. Use of this Card constitutes acceptance of those terms and conditions. 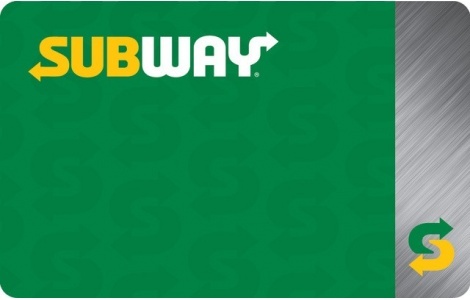 The Subway® Card can also be used in conjunction with the Subway MyWay™ Rewards Program, which is administered separately.